The recently-announced HTC Incredible is not the only hot topic in the mobile universe right now. It all started a few days back when a previously unknown iPhone model was found lying on the floor of a bar, disguised like an Apple iPhone 3GS. It wasn't until yesterday when Gizmodo gained possession of the device and revealed this is indeed the next-generation hardware from Apple, which we hope to see officially this summer. It was really exciting to get our first look at the smartphone and see it has some nice and much-wanted features like a front-facing camera and flash... in addition to the completely new design, which looks slimmer and more contemporary. In what sounds like a new proof that this handset is really the new iPhone, Apple has reportedly contacted Giz and asked that they return the unit to them. Well, why would Apple want this device back, if it isn't real? 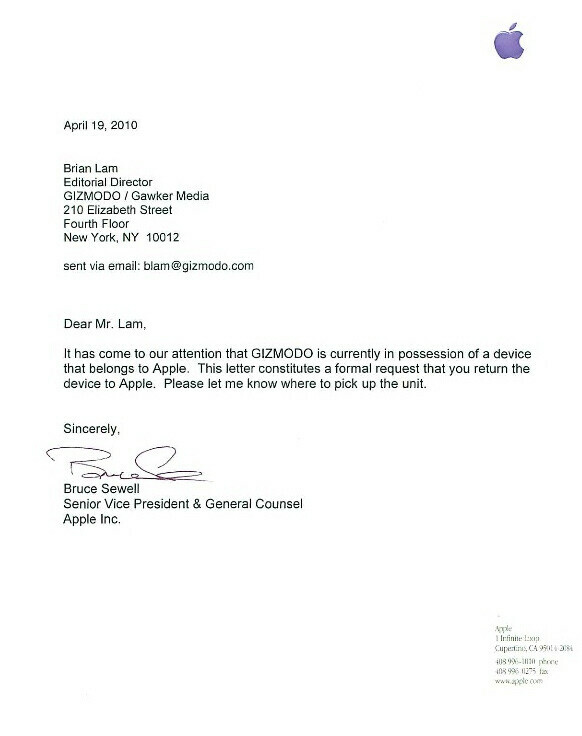 On the right is the official letter requesting that they send the phone back, and our proof that we'll most probably see a redesigned iPhone this summer. Hooray! What no pics with it powered on? It was wirelessly disabled, somehow. After Apple discovered the device was "on the loose" they had it shut down. Read the article before this one and it talks about it. not really much of a difference in my area except att is faster. i dont use my phone for calling really so it works for me. Wow, I really didn't think that it was legit. Maybe it is? If so, I'm kinda glad. I like the new design honestly and I bet it looks tons better in person. Soooo let me see if I have this right. New Apple Iphone found on the ground in a bar.................NOT So the I phone is real and the head Honcho's send a "letter" not an e-mail....a handwritten letter...they still do that.........NOT Lastly, he kindly asks "where should I pick it up? ".................Yeah RIGHT. No word (AKA...UPROAR) about how the phone got out, who is responsible etc......yeah RIGHT......NOT I'll believe it when I see it. "Sent via email: blam@gizmodo.com" "Please let me know where to pick the unit up"...Now in people speak..." Give us our sh*t back or we will sue your little company into the depths of hell!" Watch the obituaries, Mr. "Gray Powell" will probably be having a fatal accident very soon. AT&T understands whom it is they are dealing with. They are trying to control a media fire. Gizmodo would speak all about what a nasty letter would say so they need to be discreet. In an effort to keep the fire from going ablaze as well as reveal any details to the upcoming release they will say as little as possible and hope the folks at gizmodo will respect their wishes. And rest assured the doofus over at AT&T Mobility is no longer on that project. More than likely he is at least suspended for a good week or four to at most, no longer employed. You mean Apple, right? At&T is probably just sitting back and watching this play out. if apple were to send a letter to retrieve a product, it would have been from their lawyers, not from the VP asking politely where to pick it up. This is apple were talkin about, not granny smith. I think the whole thing is legit. There are too many things that provide evidence: the internal parts made by usual Iphone parts makers, the device showed up in Itunes and Mac OS Profiler, and now Apple wants the device back. It is most certainly a prototype that a developer carried around and irresponsibly lost. June is just around the corner and I can't wait to see what happens. I REMEMBER READING MONTH AGO AND EVEN SAW IT ON THE NEWS THAT A WORKER FOR APPLE LOST THE NEXT GEN IPHONE PROTOTYPE AND COMMITTED SUICIDE A FEW DAYS LATER....COULD THIS BE THE PROTOTYPE HE LOST??????? according to the guys facebook page, he did lose his job. They basically retracted that statement and believes it's legit. I hope tht was sarcasm when u said it's CDMA. Wcdma yeah. But it has a sim slot. (or micro sim slot) so not CDMA.